Sept. 18--Japanese begin conquest of Manchuria. March 1--Manchuria becomes Japanese puppet state of Manchukuo. Jan. 30--Adolf Hitler becomes chancellor of Germany. March 27--Japan leaves League of Nations. Oct. 14--Germany leaves League of Nations. Jan. 26--Germany and Poland sign 10-year nonaggression pact. June 30--Hitler carries out blood purge of Nazi Party. July 25--Unsuccessful pro-Nazi revolt takes place in Austria; Chancellor Engelbert Dollfuss is assassinated. March 16--Hitler reintroduces compulsory military service. May 2--France and the USSR sign five-year mutual assistance treaty. June 18--Anglo-German naval agreement is signed. Oct. 3--Benito Mussolini invades Ethiopia. Jan. 15--Japan withdraws from London Naval Conference. May 5--Italians capture Addis Ababa, ending major operations in Ethiopia. July 17-18--Spanish Civil War begins. Oct. 25--Germany and Italy form Rome-Berlin Axis. Nov. 25--Germany and Japan sign Anti-Comintern Pact. July 7--Marco Polo Bridge incident near Peiping sets off Sino-Japanese War. Dec. 12--Japanese planes sink United States gunboat Panay in Yangtze River. Sept. 29-30--Munich Conference approves German acquisition of the Sudetenland. March 15--Hitler occupies rest of Czechoslovakia. March 28--Insurgent forces complete conquest of Spain. Aug. 23--Germany and the USSR sign nonaggression pact. Sept. 17--Soviet forces invade Poland. Oct. 6--Last organized Polish resistance is broken at Kock. Nov. 30--Soviet forces invade Finland. March 12--Finland capitulates, signing Treaty of Moscow. April 9--Germans begin invasion of Norway and seize Denmark. April 14--Anglo-French forces reach Norway. May 2--Anglo-French forces are driven from central Norway. May 10--Germans invade the Netherlands, Belgium, and Luxembourg. May 20--Germans break through to English Channel at Abbeville. June 4--British complete evacuation of Dunkerque. June 9--Norwegian Army agrees to armistice. June 22--German-French armistice is signed (fighting ends June 25 after signature of Italo-French armistice June 24). July 3--British attack French Fleet at Oran and Mers-el-Kebir. July 10--Battle of Britain begins. Aug. 5--Italians invade British Somaliland (conquest is completed Aug. 19). Sept. 23--British and Free French attempt unsuccessfully to take Dakar (attack ends Sept. 25). Oct. 31--Germans begin breaking off Battle of Britain. Dec. 9--Gen. Sir Archibald Wavell launches British counteroffensive in Egypt. Feb. 7--Trapped Italian army surrenders to British at Bedafomm, Libya. Feb. 12--Gen. Erwin Rommel arrives in Tripoli to take over North African campaign for Axis. March 1--Italians finally check Greek counteroffensive. March 5--British forces reach Greek mainland. March 16--British land at Berbera, British Somaliland. March 24--Axis forces launch offensive in North Africa (Tobruk is invested by April 11). April 6--Axis forces invade Yugoslavia and Greece; British occupy Addis Ababa. April 17--Yugoslav Army capitulates; British begin evacuating Greek mainland. April 30--Organized resistance ends on Greek mainland. May 2--British attack insurgents in Iraq (campaign ends May 31 with occupation of Baghdad). May 20--Germans begin airborne attack on Crete. May 31--Germans complete conquest of Crete. June 8--British attack Vichy French forces in Syria, defeating them in six days. June 22--Hitler invades the USSR. Aug. 21--Hitler turns German main effort southward toward Kiev. Sept. 8--Leningrad's land connections with rest of the USSR are severed. Nov. 18--British begin second invasion of Libya. Nov. 27--Conquest of Italian East Africa is completed with surrender of Gondar. Nov. 28--Germans are forced to evacuate Rostov. Dec. 5--German offensive stalls 25 miles from Moscow. Dec. 7--Rommel begins withdrawal to El Agheila. Dec. 10--British advance in Libya relieves Tobruk. Jan. 2--British capture bypassed fortress of Bardia, Libya. Jan. 11--Rommel withdraws westward toward El Agheila. Jan. 17--British reduce bypassed German garrison of Halfaya. Jan. 20--Russians recapture Mozhaisk, 65 miles west-southwest of Moscow. Jan. 21--Rommel launches major counteroffensive. Jan. 26--First United States troops arrive in Northern Ireland. Jan. 28--British Eighth Army withdraws to El Gazala-Bir Hacheim Line. Feb. 1--Soviet counteroffensive begins to bog down in German hedgehog defense system. Feb. 12--German warships Scharnhorst, Gneisenau, and Prinz Eugen escape from Brest and run up English Channel to German ports. March 27--British carry out successful raid against St. Nazaire, France. May 8--Germans begin minor operations to prepare for summer offensive in the USSR. May 12--Russians launch large-scale spoiling offensive against Kharkov. May 17--Germans counterattack in Kharkov sector. May 27--Rommel launches major offensive against El Gazala-Bir Hacheim line. May 28--Germans complete defeat of Soviet Kharkov offensive. May 30--Royal Air Force begins major air offensive against Germany with heavy raid on Cologne. June 10--Rommel forces evacuation of Bir Hacheim. June 14--British withdraw toward Egypt. June 20--Rommel breaks into Tobruk, completing its capture June 21. June 24--Rommel reaches Sidi Barrani, Egypt. June 28--Germans launch main summer offensive in the USSR. June 30--British are forced back on prepared positions at El Alamein. July 1--Germans complete capture of Sevastopol. July 2--British Eighth Army begins limited counterattacks against Axis forces in Egypt. July 4--American crews participate in Royal Air Force raid on airfields in the Netherlands, in the first United States air operation in Europe. July 6--Germans capture Voronezh, near Don River. July 9--German offensive in the USSR divides, one army group advancing through Rostov into the Caucasus oilfields and the other toward Stalingrad. Aug. 9--Germans penetrate northern foothills of the Caucasus. Aug. 19--British and Canadians, accompanied by small detachment of United States Rangers, make amphibious raid on Dieppe, France. Aug. 31--Axis forces attack El Alamein position (Battle of Alam el Halfa). Sept. 7--Lt. Gen. Bernard Law Montgomery halts British counterattack at Alam el Halfa; begins elaborate preparations for major counteroffensive. Sept. 16--Germans penetrate Stalingrad suburbs. Oct. 23--British Eighth Army opens El Alamein offensive. Nov. 1--Heavy fighting continues in Stalingrad and the Caucasus; Russians are gradually wearing down German offensive. Nov. 5--Axis troops withdraw from El Alamein area. Nov. 8--British and Americans land in Morocco and Algeria. Nov. 9--German troops begin occupying Tunisia. Nov. 10--Adm. Jean Francois Darlan orders French forces in North Africa to cease resistance to Allied invasion. Nov. 11--Eighth Army's pursuit crosses Egyptian frontier into Libya, taking Bardia; Axis troops move into unoccupied France. Nov. 19--Russians begin offensive in Stalingrad area. Nov. 22--Converging Soviet attacks cut off German Sixth Army around Stalingrad. Nov. 27--French warships in Toulon harbor are scuttled to prevent seizure by Germans. Nov. 30--Determined German resistance halts Allied invasion of Tunisia. Dec. 12--Germans counterattack to relieve Sixth Army at Stalingrad. Dec. 16--Soviet offensive against Italian Eighth Army on middle Don River forces abandonment of effort to relieve Stalingrad. Dec. 24--Lt. Gen. Dwight D. Eisenhower, commanding Allied forces in North Africa, decides to postpone Tunisian offensive until end of rainy season. Jan. 2--German troops in Caucasus area begin withdrawing northward through Rostov. Jan. 10--Russians begin attack against Stalingrad pocket. Jan. 12--Russians attempt to raise siege of Leningrad. Jan. 16--Berlin is raided by Royal Air Force for the first time since Nov. 7, 1941. Jan. 18--Germans open limited offensive in Tunisia; Russians reopen land communications with Leningrad. Jan. 23--British Eighth Army occupies Tripoli; Germans break off Tunisian offensive. Jan. 27--United States Eighth Air Force bombs Wilhelmshaven in its first attack on Germany. Feb. 2--Last elements of German Sixth Army surrender at Stalingrad; Russian spearheads push energetically toward Rostov, Kharkov, and Kursk. Feb. 4--British Eighth Army crosses into Tunisia from Libya. Feb. 14--Germans launch spoiling offensive against United States 2d Corps in Tunisia; Russians capture Rostov. Feb. 20--Rommel breaks through Kasserine Pass in Tunisia. Feb. 21--Germans launch counteroffensive toward Kharkov. Feb. 22--Rommel begins to withdraw through Kasserine Pass. March 6--Rommel is repulsed in attack on British Eighth Army near Medenine. March 14--Germans complete recapture of Kharkov. March 17--United States 2d Corps begins offensive in Tunisia. March 20--British Eighth Army attacks Mareth Line. March 27--Enveloping attack by British Eighth Army forces Germans to evacuate Mareth Line and retire northward. April 23--British-United States staff is established in England under Lt. Gen. Sir Frederick E. Morgan to plan invasion of northwestern Europe. May 4--Final Allied offensive opens in Tunisia. May 13--Last Axis forces surrender in Tunisia. May 16-17--Royal Air Force raid breaches Mohne and Eder dams, flooding portions of the Ruhr. May 18--Air offensive begins against Pantelleria Island to clear way for invasion of Sicily. June 14--With occupation of Lampione in Pelagie Islands, Allies gain control of all islands between Sicily and Tunisia. June 20--Royal Air Force makes first shuttle-bombing raid between England and North Africa. June 22--United States Eighth Air Force makes its first large-scale daylight raid on Ruhr area. July 5--Germans launch offensive against Kursk salient. July 9--Allied forces invade Sicily; German Kursk offensive is checked. July 12--Russians open major offensive against Orel salient. July 22--United States Seventh Army takes Palermo, Sicily; Soviet offensive spreads across entire front. July 24--United States Eighth Air Force makes its first raid on Norway. Aug. 1--Mass, low-level American air raid is made on Ploesti, Romania. Aug. 5--Russians capture Orel and Belgorod. Aug. 17--American and British forces converge at Messina, Sicily; United States Eighth Air Force raids Schweinfurt and Regensburg; Royal Air Force attacks German V-weapons experimental center at Peenemunde. Aug. 23--Germans evacuate Kharkov; Russians attack heavily on Mius River front. Sept. 3--British Eighth Army forces, crossing from Sicily, land on Italian coast; Italian government signs secret armistice (effective Sept. 8). Sept. 8--Italian armistice is announced; Italian Fleet and aircraft surrender to Allies. Sept. 9--British amphibious assault seizes Taranto; Allied forces land at Salerno. Sept. 11--German counterattacks begin in Salerno area. Sept. 13--German counterattacks seriously threaten Salerno beachhead. Sept. 14--German Salerno attacks are contained. Sept. 17--Germans begin fighting withdrawal from Salerno front; Russians take Bryansk. Sept. 18-19--Allies occupy Sardinia, following German evacuation. Sept. 24--Germans evacuate Smolensk and Roslavl. Oct. 1--Allied forces enter Naples. Oct. 4--Germans seize Kos, site of only Allied air base in Aegean Sea; Allied forces gain control of Corsica. Oct. 6--United States Fifth Army reaches Volturno River in Italy. Oct. 12-13--United States Fifth Army carries out assault crossing of Volturno River. Oct. 14--United States Eighth Air Force raids Schweinfurt ball-bearing plants. Nov. 1--Soviet offensive against the Crimea makes progress. Nov. 5--United States Fifth Army begins assault against Winter Line in Italy. Nov. 14--Germans launch counterattack in Zhitomir area (recapture city Nov. 19). Nov. 15--Attack on Winter Line is halted for regrouping. Nov. 20--British Eighth Army attacks on Sangro River front in Italy. Dec. 1--United States Fifth Army attacks Winter Line in Liri Valley. Dec. 2--Luftwaffe makes effective raid on Bari, Italy. Dec. 14--Russians begin winter offensive. Dec. 16--Germans evacuate San Pietro Infine, key point in Winter Line. Dec. 24--United States Eighth Air Force makes major effort against German secret weapon sites. Jan. 5--Final phase of Winter Line offensive begins in Italy. Jan. 15--Operations against Winter Line are successfully concluded; Russians launch major surprise offensive on Leningrad front. Jan. 16--Eisenhower assumes post as supreme commander of Allied Expeditionary Force. Jan. 22--Allies begin landing at Anzio, Italy; Germans halt Russians around Vitebsk, though Russians continue gains elsewhere. Jan. 23--Americans are repulsed in attempt to force Rapido River in Italy. Feb. 3--German counteroffensive against Anzio beachhead begins during night; Allies on main Italian battlefront stall in front of Cassino. Feb. 6--Soviet offensive in the Ukraine makes great progress near Nikopol. Feb. 18--Anzio beachhead is under extreme pressure. Feb. 19--Allied counterattack checks German Anzio offensive. March 4--German forces around Anzio beachhead go over to the defensive; first American air raid is made on Berlin. March 13--Soviet troops force Dnieper River and take Kherson. March 15--Allies make third assault on Cassino; Russians break through German defenses along Bug River. March 30--Royal Air Force bombing raid on Nurnberg suffers extremely heavy losses. April 15--Soviet offensive into Poland captures Tarnopol. May 9--Russians recapture Sevastopol; United States Eighth Air Force begins attacks on German airfields in northern France. May 11--Allies launch major offensive against Gustav Line in drive for Rome. May 12--United States Eighth Air Force attacks oil plants in central Germany. May 13--French Expeditionary Corps penetrates Gustav Line. May 21--Allied fighter aircraft begin operations against enemy railroads in France and Germany. May 23--Allied forces in Anzio beachhead begin breakout offensive. May 30--Loading of Allied assault forces for Operation Overlord is begun. June 2--United States Fifteenth Air Force begins shuttle bombing between Italian and Soviet bases. June 3--Combat loading of troops for Operation Overlord is completed. June 4--Allied forces enter Rome; D-day for Operation Overlord is postponed from June 5 to June 6. June 6--Operation Overlord begins; Allies land on coast of Normandy. June 8--American and British beachheads establish contact. June 9--Russians launch offensive against Finns on Karelian Isthmus. June 12--Allies capture Carentan in Normandy. June 17--French force lands on Elba. July 3--United States First Army attacks southward from beachhead (battle of the hedgerows). July 18--United States First Army captures St.-Lo; Soviet offensive is checked at Augustow, but still advances elsewhere. July 19--United States Fifth Army captures Leghorn. July 21--Soviet offensive crosses Bug River. July 25--United States First Army launches major breakout offensive (Operation Cobra). Aug. 1--United States Twelfth Army Group becomes operational in France; Polish underground forces revolt as Soviet advance nears Warsaw. Aug. 4--Allied forces in Italy halt along Arno River to regroup for offensive against Gothic Line. Aug. 7--United States Third Army reaches Brest; Germans launch major counterattack near Mortain; Soviet offensive is generally checked. Aug. 10--Having halted German Mortain counteroffensive, United States First Army resumes advance. Aug. 13--Allied forces begin closing Falaise-Argentan pocket. Aug. 15--United States Seventh Army lands in southern France (Operation Dragoon). Aug. 16--United States Third Army captures Orleans. Aug. 19--French underground forces begin Paris uprising. Aug. 20--Falaise-Argentan pocket is completely closed; United States Third Army crosses Seine near Mantes-Gassicourt; Russians open offensive against Romania. Aug. 25--Allied forces enter Paris; attack on Gothic Line begins in Italy. Aug. 28--French complete capture of Toulon-Marseille area. Sept. 1--Gasoline shortage halts United States Third Army; Germans begin withdrawal from Greek mainland and adjacent islands. Sept. 4--British enter Antwerp; truce is established between the USSR and Finland. Sept. 6--United States Third Army attacks Moselle River line. Sept. 7--United States Third Army begins attacks on Metz. Sept. 9The USSR grants Bulgaria an armistice. Sept. 10--Decision is reached to postpone opening Antwerp's port until effort (Operation Market-Garden) has been made to secure a Rhine crossing; United States Third Army begins large-scale Moselle crossing; United States First Army captures city of Luxembourg. Sept. 11--Patrols from Overlord and Dragoon forces establish contact near Dijon. Sept. 12--German garrison of Le Havre surrenders; United States First Army reaches West Wall. Sept. 13--Shuttle bombing between Western and Soviet bases is discontinued. Sept. 14--United States First Army reaches suburbs of Aachen; United States Third Army surrounds Nancy; Russians capture Warsaw suburb of Praga, and begin offensive in Estonia and Latvia; United States Fifth Army is repulsed in attacks on Gothic Line in Italy. Sept. 15--United States First Army breaches West Wall. Sept. 17--Operation Market-Garden is launched. Sept. 18--Germans counterattack British airborne troops at Arnhem, Netherlands. Sept. 19--United States Ninth Army completes mopping up in Brittany. Sept. 20--British force Germans to withdraw from Rimini Line in Italy. Sept. 23--Russians break through German lines to Gulf of Riga. Sept. 25--United States Fifth Army completes penetration of Gothic Line in Italy. Sept. 26--Germans overrun last British units in Arnhem area, ending decisive phase of Operation Market-Garden. Sept. 30--Russians cross Danube in drive on Belgrade. Oct. 2--Germans complete suppression of Warsaw revolt. Oct. 3--British troops land in southern Greece. Oct. 13British airborne troops are dropped near Athens; Germans begin V-1 attacks on Antwerp. Oct. 14--British troops enter Athens; Russians and Yugoslavs encircle Belgrade. Oct. 15--United States First Army surrounds Aachen. Oct. 18--Russians break into eastern Czechoslovakia. Oct. 22--Russians advance from Petsamo, Finland, to Norwegian frontier. Oct. 24--British and Canadians begin clearing approaches to Antwerp port. Oct. 25--Russians enter Kirkenes, Norway. Nov. 4--Channel to Antwerp is opened for minesweeping. Nov. 8--Approaches to Antwerp are completely cleared; United States Third Army begins offensive toward the Saar. Nov. 16--United States First and Ninth armies begin attempt to clear area between Wurm and Roer rivers (Operation Queen). Nov. 19--United States Third Army surrounds Metz. Nov. 20--French First Army breaks into Belfort. Nov. 23--French troops with United States Seventh Army take Strasbourg. Nov. 28--Antwerp port is opened for shipping. Dec. 5--Clashes occur between British troops and Greek factions in Athens. Dec. 6--Russians intensify offensive toward Budapest, Hungary. Dec. 13--Last bypassed Metz fort (Jeanne d'Arc) surrenders to United States Third Army. Dec. 16--Germans open major counteroffensive against United States Twelfth Army Group in Ardennes area. Dec. 19--United States 101st Airborne Division reaches Bastogne; elements of United States Third Army prepare to move north; United States Seventh Army goes on defensive in Alsace-Lorraine. Dec. 21--Germans begin siege of Bastogne. Dec. 23--Soviet forces close in on Budapest; heavy fighting takes place in Lake Balaton area of Hungary. Dec. 26--Tanks of 4th Armored Division of United States Third Army break through to Bastogne. Dec. 27--Roads into Bastogne from the south are opened for trucks and ambulances; Russians complete encirclement of Budapest. Dec. 30--Allied forces begin counterattacks in the Ardennes. Dec. 31--Germans launch offensive against United States Seventh Army in Alsace-Lorraine. Jan. 1--Last major German air raid is made against Allied airfields. Jan. 2--Germans counterattack to relieve Budapest. Jan. 3--United States First Army begins counteroffensive against northern flank of Ardennes salient. Jan. 5--Allied forces in Italy begin regrouping for spring offensive. Jan. 12--Russians launch large-scale winter offensive in Poland (extend it to East Prussia Jan. 14). Jan. 20--French First Army begins offensive in Alsace-Lorraine against Colmar pocket. Jan. 25--German Alsace-Lorraine offensive ends with unsuccessful attack near Haguenau. Jan. 28--Russians complete conquest of Lithuania and envelopment of Konigsberg. Feb. 2--United States First Army begins advance to seize Roer River dams. Feb. 4--Allied forces in Italy begin limited operations in preparation for spring offensive. Feb. 8--Canadian First Army begins Operation Veritable to clear area between Maas and Rhine rivers (with subsidiary Operation Blockbuster, successfully completed March 10). Feb. 9--French First Army completes reduction of Colmar pocket. Feb. 10--United States First Army seizes main Roer dam but finds that Germans have destroyed outlet controls. Feb. 12--Varkiza agreement ends civil war in Greece. Feb. 13--Russians overrun last German position in Budapest. Feb. 23--United States Ninth Army attacks across Roer River (Operation Grenade) toward Rhine. March 6--Operation Grenade is successfully completed. March 7--United States First Army completes capture of Cologne; its 9th Armored Division seizes Rhine bridge at Remagen intact. March 15--United States Third and Seventh armies launch coordinated offensive (Operation Undertone) to clear Saar-Palatinate triangle (successfully completed March 25). March 16--Russians begin offensive against Vienna. March 22--United States Third Army makes assault crossing of Rhine at Oppenheim. March 23--British Second Army crosses Rhine (Operation Plunder) in Rees-Wesel area. March 24--United States Ninth Army attacks across Rhine in Dinslaken area; United States Third Army begins similar attack (completed March 25) at Boppard. March 26--United States Seventh Army crosses Rhine near Worms. March 31--French First Army crosses Rhine near Speyer and Germersheim. April 1--United States Ninth and First armies establish contact at Lippstadt, isolating Ruhr area. April 9--Russians storm bypassed Konigsberg fortress; British Eighth Army opens major offensive in Italy. April 12--United States Ninth Army establishes bridgehead on east bank of Elbe. April 13--United States Ninth Army seizes second Elbe bridgehead; Russians secure Vienna. April 14--Americans lose one Elbe bridgehead; United States Fifth Army joins in Italian offensive. April 16--Russians begin heavy offensive against Berlin. April 17--United States Seventh Army attacks Nurnberg. April 18--Organized German resistance in Ruhr collapses; United States Third Army patrols enter Czechoslovakia. April 20--United States Seventh Army completes capture of Nurnberg. April 21--Organized German resistance ends in Harz Mountains. April 23--Russians fight way into Berlin; United States Fifth Army begins assault crossing of Po River. April 25--United States First Army patrol makes contact with Russians near Torgau. April 26--British complete capture of Bremen. April 29--British Second Army begins advance from Elbe River to Baltic; United States Fifth Army enters Milan; German Southwest Army Group in Italy surrenders unconditionally. April 30--United States Seventh Army occupies Munich. May 2--British Second Army reaches Baltic, capturing Lubeck and Wismar; Russians mop up Berlin; fighting ends in Italy; New Zealand troops occupy Trieste. May 4--Germans surrender forces in the Netherlands, northwestern Germany, and Denmark (effective May 5); patrols of United States Fifth and Seventh armies meet near Brenner Pass. May 5--United States Third Army begins offensive into Czechoslovakia; German Army Group G surrenders in Bavaria to United States Sixth Army Group. May 6--United States Third Army takes Plzen, Czechoslovakia. May 7--German High Command surrenders all forces unconditionally at Reims; Russians finally capture Breslau. Nov. 26--Pearl Harbor striking force sails from Kuril Islands. Dec. 7--Japanese carrier aircraft attack United States naval base at Pearl Harbor, Hawaii, and nearby Army air bases; Japanese destroyers bombard Midway Island. Dec. 8--Japanese planes raid American air bases in Philippines; Japanese invade Thailand and Malaya; seize Shanghai International Settlement; attack mainland territories of Hong Kong; bombard Wake and Guam. Dec. 9--Japanese invade Gilbert Islands. Dec. 10--Japanese seize Guam and begin landings on Luzon; British warships Repulse and Prince of Wales are sunk off Malaya. Dec. 11--Attempt by Japanese to seize Wake Island is repulsed; Japanese begin invasion of Burma. Dec. 13--Japanese force British to withdraw from mainland to Hong Kong Island. Dec. 16--Japanese invade British Borneo and Burma. Dec. 18--Japanese invade Hong Kong Island. Dec. 20--Japanese land near Davao, Mindanao, Philippines. Dec. 22--Japanese make major landing at Lingayen Gulf, Luzon, Philippines; Chiang Kai-shek offers Chinese troops for defense of Burma; first American troops reach Australia. Dec. 23--Japanese overrun Wake Island; Gen. Douglas MacArthur decides to withdraw into Bataan Peninsula, Luzon. Dec. 25--Japanese complete conquest of Hong Kong. Jan. 7--American and Philippine forces complete withdrawal into Bataan Peninsula. Jan. 11--Japanese begin invasion of Netherlands East Indies. Jan. 20--Japanese begin major offensive in Burma. Jan. 22--MacArthur orders withdrawal to final Bataan defensive position. Jan. 23--Japanese make amphibious landings behind American-Philippine positions on Bataan, but are contained; seize Rabaul, New Britain; and land on New Ireland and Solomon Islands. Jan. 24--United States destroyers raid Japanese shipping off Balikpapan, Borneo (Battle of Makassar Strait). Jan. 26--Withdrawal to final Bataan defensive position is successfully completed. Jan. 27--British forces in Malaya begin withdrawal to Singapore Island. Jan. 31--British complete withdrawal to Singapore Island. Feb. 1--United States Pacific Fleet attacks Japanese bases in Marshall and Gilbert Islands. Feb. 2--Lt. Gen. Joseph W. Stilwell is appointed chief of staff to Chiang Kai-shek. Feb. 4--Dutch-United States naval force is badly damaged by Japanese aircraft in Madoera Strait, Netherlands East Indies. Feb. 8--Japanese forces break off Bataan attacks to reorganize for future decisive offensive; Japanese gain foothold on Singapore Island. Feb. 14--Japanese paratroopers seize Palembang area, Sumatra. Feb. 18--Japanese seize Bali, isolating Java. Feb. 19--Darwin, Australia, is badly damaged by massive Japanese air attacks. Feb. 22--President Franklin D. Roosevelt orders MacArthur to leave Philippines. Feb. 23--British in Burma are forced back across Sittang River; Japanese submarine shells refinery near Santa Barbara, Calif.
Feb. 27--Allied naval forces are decisively defeated during attack on Japanese convoy (Battle of the Java Sea). March 7--British evacuate Rangoon, Burma. March 7-8--Japanese land on New Guinea. March 9--Dutch forces surrender to Japanese on Java. March 11--MacArthur, family, and staff leave Bataan (reach Darwin March 17). March 24--Japanese begin heavy air and artillery bombardment of Bataan and Corregidor. April 3--Japanese launch major offensive against Bataan. April 4--Japanese carrier task force begins large-scale raid into Indian Ocean, attacking Colombo and Trincomalee, Ceylon, during following week. April 9--American-Philippine forces on Bataan surrender; Japanese concentrate planes and artillery against Corregidor. April 18--MacArthur assumes command of Southwest Pacific area; Lt. Col. James H. Doolittle leads air raid on Tokyo. April 29--Japanese seize Lashio, southern terminus of Burma Road. May 3--Japanese occupy Tulagi, Solomon Islands. May 4--United States carrier planes raid Tulagi. May 5--British invade Madagascar; Japanese make assault landing on Corregidor. May 6--Lt. Gen. Jonathan M. Wainwright surrenders all forces in Philippines unconditionally. May 7--Battle of the Coral Sea begins (ends May 8). May 10--American-Philippine forces in Mindanao, Palawan, and Visayan Islands begin surrendering (process is completed June 9). May 20--Japanese complete conquest of Burma. June 3--American aircraft from Midway locate main Japanese fleet approaching that island. June 4--Japanese are decisively defeated in Battle of Midway (pursuit continues into June 6). June 6-7--Japanese land troops on Aleutian islands of Attu and Kiska. July 2--Joint Chiefs of Staff order recovery of New Britain-New Ireland-New Guinea area, beginning with occupation of lower Solomon Islands. July 22--Japanese land at Gona and Buna, New Guinea, for overland advance against Port Moresby. Aug. 7--United States Marines begin landing on Guadalcanal, Solomon Islands. Aug. 8-9--Japanese naval task force inflicts serious losses on Allied fleet off Guadalcanal (Battle of Savo Island); Allied naval forces retire from Guadalcanal area. Aug. 21--First Japanese assault on Henderson Field, Guadalcanal, is repulsed. Aug. 24--United States carrier task force defeats Japanese in Battle of the Eastern Solomons. Aug. 25--Japanese begin attack on Milne Bay, New Guinea. Sept. 5--Japanese begin evacuating Milne Bay beachhead. Sept. 9--Japanese plane (launched from submarine) starts small forest fire near Brookings, Oreg. (this was the only bombing attack on the continental United States during war). Sept. 13-14--Japanese launch unsuccessful major offensive on Guadalcanal. Sept. 16--Japanese advance against Port Moresby is halted. Oct. 11-12--United States naval task force defeats Japanese off Guadalcanal (Battle of Cape Esperance). Oct. 13--United States Army units land on Guadalcanal. Oct. 14--Henderson Field, Guadalcanal, is temporarily rendered unusable by Japanese bombardment; Japanese mass for attack on American beachhead. Oct. 23--Japanese launch major Guadalcanal counteroffensive. Oct. 25-26--Japanese Guadalcanal attacks fail. Oct. 26--Japanese are defeated in naval Battle of Santa Cruz. Oct. 29--Alaska Highway is open for traffic; Japanese break contact with United States forces on Guadalcanal and withdraw northward. Nov. 1--Americans begin Guadalcanal offensive. Nov. 12--Series of naval engagements (Battle of Guadalcanal, ending Nov. 15) thwarts Japanese efforts to land reinforcements on Guadalcanal. Nov. 16--Australians and Americans, having forced Japanese back into Buna-Gona beachhead during past month, attack that position. Nov. 30--Japanese are thwarted in effort to reinforce Guadalcanal, but defeat United States cruiser task force (Battle of Tassafaronga). Dec. 16--British begin limited offensive in Arakan coastal area in Burma. Dec. 18--Allies begin major offensive against Japanese positions around Buna. Jan. 2--Organized Japanese resistance at Buna ends. Jan. 22--Japanese positions around Sanananda, New Guinea, are overrun. Feb. 1--Japanese begin evacuation of Guadalcanal (operation is completed Feb. 7). Feb. 8--Brig. Orde C. Wingate's Chindits begin three-month raid against Mandalay-Myitkyina railroad. Feb. 9--Organized Japanese resistance ends on Guadalcanal. Feb. 21--Americans land on Russell Islands. March 2--Battle of the Bismarck Sea begins (ends March 4 with destruction of entire Japanese convoy). March 12--Japanese defeat British on Arakan front. March 26--United States naval task force turns back effort by Japanese to reinforce their Aleutian garrisons. April 18--Adm. Isoroku Yamamoto is killed when a Japanese plane is shot down over Solomon Islands. May 11--American expeditionary force lands on Attu. May 12--British withdraw to original positions in Arakan sector of Burma. May 30--Japanese resistance collapses on Attu. June 30--Operation Cartwheel begins with Allied landings in central Solomon Islands, Trobriand Islands, and Nassau Bay area of New Guinea. July 5--United States naval forces partially block Japanese attempt to reinforce Kolombangara Island, central Solomons (Battle of Kula Gulf). July 12--United States naval task force fails to prevent Japanese reinforcements from reaching Kolombangara (Battle of Kolombangara or Second Battle of Kula Gulf). July 28--Japanese evacuate Kiska undetected by Allies. Aug. 5--After 12 days of heavy fighting, Americans capture Munda Airfield, New Georgia, central Solomons. Aug. 6--Japanese naval force is defeated off Kolombangara (Battle of Vella Gulf). Aug. 15--Allied force begins landing on Kiska (by Aug. 22, concedes island is deserted). Oct. 2--Japanese withdraw successfully from Kolombangara; Australians capture Finschhafen, New Guinea. Oct. 6-7--Japanese destroyers fight off smaller force of American destroyers while evacuating Japanese troops from Vella Lavella (Battle of Vella Lavella). Oct. 12--United States Army Air Forces begin heavy air attacks on Rabaul, New Britain. Nov. 1--Americans land on Bougainville Island, northern Solomons; during following night, Japanese naval task force is defeated offshore (Battle of Empress Augusta Bay). Nov. 21--Americans begin landing on Makin and Tarawa, Gilbert Islands (atolls are cleared in three days). Nov. 25--Japanese destroyers are defeated off New Ireland (Battle of Cape St. George). Dec. 24--Bougainville beachhead, containing new airfields, is secured. Dec. 26--Americans land at Cape Gloucester, New Britain. Dec. 29-30--Cape Gloucester airfields are secured. Jan. 25--Chinese troops under General Stilwell begin counteroffensive in Burma. Feb. 1--Americans land on Kwajalein, Marshall Islands (atoll is cleared by Feb. 8). Feb. 18--United States naval task forces complete neutralization of Japanese base at Truk; Americans begin landing on Eniwetok, Marshall Islands (atoll is secured by Feb. 23). Feb. 24--United States 5307th Composite Unit (Merrill's Marauders) begins raid aimed at Myitkyina airfield. Feb. 29--Americans land on Los Negros Island, Admiralty Islands. March 8--Japanese attack perimeter around Bougainville airfields; launch drive from Burma on Imphal and Kohima, India. March 24--Organized Japanese resistance is broken on Bougainville and Los Negros. April 17--Japanese launch offensive in Honan, China, directed at United States B-29 bases. April 22--Allied forces land in Hollandia area of New Guinea. May 17--Allied operations are commenced against Wakde Islands off Netherlands New Guinea coast; Marauders capture Myitkyina airfield. May 24--Japanese begin counterattack at Myitkyina. May 27--In New Guinea area, Allied forces land on Biak Island. June 5--Japanese are defeated in Imphal-Kohima area. June 15--United States Marines invade Saipan, Mariana Islands. June 19--Japanese Fleet is badly defeated by United States carrier aviation in Battle of the Philippine Sea ("Marianas Turkey Shoot; battle ends June 20). June 22--Japanese begin retreat from Kohima-Imphal area. July 21--Americans land on Guam. July 24--Americans land on Tinian, Mariana Islands. July 28--Organized Japanese resistance ends on Biak. July 30--Americans land on Vogelkop Peninsula, New Guinea. Aug. 3--Myitkyina, Burma, is captured. Aug. 10--Organized Japanese resistance is destroyed on Guam. Aug. 29--Japanese continue successful offensive against American Honan air bases. Sept. 15--Americans land on Morotai Island and Palau Islands. Oct. 10--United States Third Fleet carrier task force raids Okinawa. Oct. 13--United States Third Fleet begins raids on Taiwan. Oct. 15--Allies begin offensive to clear northern Burma. Oct. 17--United States Ranger units occupy small islands at entrance to Leyte Gulf. Oct. 18--General Stilwell is relieved. Oct. 20--United States Sixth Army invades Leyte. Oct. 21--Palau Islands are secured. Oct. 23--Battle for Leyte Gulf begins between United States and Japanese fleets (ends Oct. 26 with Japanese defeat). Nov. 24--B-29's make first raid on Tokyo from bases in Mariana Islands. Dec. 10--Japanese forces in southern China link up with Japanese forces in French Indochina. Dec. 12--British launch offensive in Arakan sector of Burma. Dec. 15--Americans invade Mindoro, Philippines. Jan. 1--Major offensive operations are completed on Leyte (mopping up continues until May 8). Jan. 2--United States convoys begin moving toward Luzon, Philippines. Jan. 3--British Arakan offensive recaptures Akyab. Jan. 9--United States Sixth Army begins landing at Lingayen Gulf, Luzon. Jan. 20--Converging attacks from China and Burma reopen Burma Road. Feb. 3--United States 1st Cavalry Division enters Manila. Feb. 16--Americans launch airborne-amphibious assault on Corregidor Island, Manila Bay (completed March 2); heavy preparatory naval-air bombardment of Iwo Jima, Volcano Islands, begins. Feb. 19--United States Marines land on Iwo Jima. Feb. 25--United States 21st Bomber Command makes first mass incendiary-bomb raid on Tokyo. March 3--Last Japanese position in Manila is wiped out. March 10--Americans land on Mindanao, Philippines. March 16--Iwo Jima is declared secure. March 18-19--United States carrier aircraft attack Japanese air and naval bases in preparation for coming invasion of Okinawa. March 21--British complete recapture of Mandalay, Burma. March 26--Americans land on Kerama-retto near Okinawa (islands are completely occupied March 28). April 1--United States Tenth Army lands on Okinawa. April 7--Japanese naval sortie toward Okinawa is routed (Battle of the East China Sea). April 11--Japanese begin furious air offensive, using Kamikaze aircraft, against United States shipping off Okinawa. May 11--Chinese forces halt Japanese drive on Chihkiang (begun April 1944). May 20--Japanese in China begin moving troops northward to reinforce their army in Manchuria. June 21--Organized Japanese resistance on Okinawa ends. June 30--Luzon is declared secure (mopping up continues until end of war). July 1--Australians and Dutch begin operations in Balikpapan area of Borneo. July 10--United States Navy and Army aircraft begin a major offensive against Japan in preparation for planned invasion. July 16--United States tests successful atomic bomb at Alamogordo, N.Mex. July 17--British Pacific Fleet joins United States Third Fleet in attacks on Japan. Aug. 6--Atomic bomb is dropped on Hiroshima. Aug. 8--The USSR declares war on Japan (effective Aug. 9). 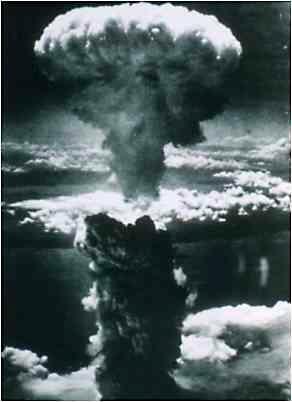 Aug. 9--Atomic bomb is dropped on Nagasaki; Russians invade Manchuria. Aug. 12--Soviet troops enter northern Korea.